Remotely view and control the temperature of the home. 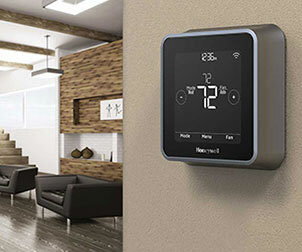 Wi-Fi enabled thermostat allows for remote access via computer, smartphone or tablet. Universal compatibility - Works with virtually any system type. Free app for Apple and Android operating systems. 4 programmable periods per day allows the user to customize programming to their unique schedule. Pre-programmed with energy saving schedule. Allows you to control the system and fan. Auto change from heating to cooling. Alerts - Filter change reminder, high/low temp and internet connection loss. Smart Response Technology - Continually learns to pre-heat/cool your home so you are comfortable at your pre-programmed times. Multiple hold options - Fixed temporary hold, adjustable, temporary hold, permanent hold and vacation hold. automatically updates the time for daylight savings (optional). Multiple display options - degrees C or F and 12 or 24 hour clock. View local weather and 5-day forecast. Online and toll-free support available. An active internet connection and a wireless router is needed to setup this device. Remotely view and control the temperature of your home with a Wi-Fi programmable thermostat. 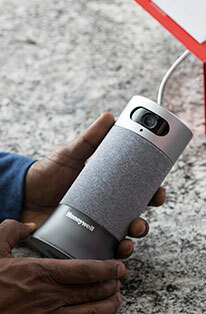 The Honeywell RET97E5D1005/U Wi-Fi Thermostat can be remote accessed via a computer, smartphone or tablet. With 7 day programming, each with its own 4 program periods, you can maximize your comfort and minimize your energy usage by creating presets focused around your schedule. Intelligent alerts can notify you of unusual temperatures, when your filter needs to be changed, loss of Wi-Fi, and even let you know when to adjust your settings based on local weather. Remotely view and control the temperature of your home with the multi-functional RET97E5D Honeywell wifi thermostat. C wire is required and is the power source. 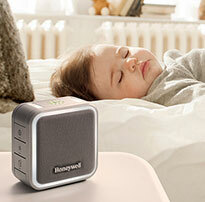 Without a C wire, The Honeywell Wi-Fi 7-Day Programmable Thermostat will not power up. Dimensions: WxHxD (in.) = 5.8 x 3.5 x 2. In order to power a Honeywell Wi-Fi thermostat, your system must contain a c-wire. Use the steps below to confirm that your system meets the compatibility requirements. This decision tree will determine compatibility with most systems, but as wiring systems vary from home to home, there may be some exceptions. 1.Does your current thermostat have 110V or higher written on it? Yes - Your current system is not compatibile. No - Move to question 2. 2. Do you have thick wires that are connected using wire nuts? No - Move to question 3. 3. Do you have a wire connected to terminal labeled "C"? Yes - Congratualtions your system is compatible with this thermostat! No - Move to question 4. 4. Do you have an extra wire that is not connected to any terminal on the thermostat wall plate? Yes - You may be able to substitute the extra wire for a C-wire. To watch a video demonstration please click here. No - Move to question 5. 5. Do you have a wire connected to terminal labeled "G"? Yes - You may be able to substitute the G-wire for a C-wire. To watch a video demonstration please click here. No - Sorry, this thermostat will not work with your current system. I ordered 2 of these thermostats for our new house. They were easy to install, with one exception: these thermostats require a C connection, and the old thermostat I was replacing didn't have a C connection. Luckily, I was able to figure out which of the unused wires in the wall was the C connection. Once I got past that issue, connecting the new thermostats to the Internet and programming them was a piece of cake. Great replacement thermostat. Easy to install and set up wifi link. Allows me control heating on vacation home. This thermostat was just as advertised. The wiring on my old thermostat was a little different and I just watched a short video on how to make it work with the new one and it was a piece of cake to install myself. A++ for all of the requirements needed. Easy to use and program. These thermostats are fantastic. I maintain 2 residences and have had problems with heating systems before. Now I can monitor and control the temperature at both, no matter where I am in the world. Amazing! Our home is now very comfortable. So easy to set desire temp 24, hours a day. Great product! This unit is easy to install, program, and connect to with mobile devices. The Wi-Fi capability was lost for about 12 hours in the first week after installing it due to Honeywell working on a server but it has worked well since then. The Honeywell RET97E5D1005/U Wi-Fi was the perfect choice for me. I purchased and installed three in a church on different type heating and cooling systems and they all worked great. The Wi-Fi setup was very easy. 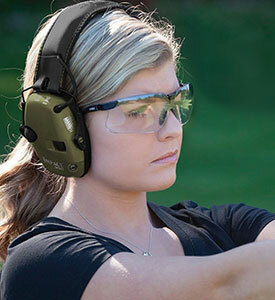 Remote operation allows you to operate and program the stat with ease. Works great, easy to install. I just installed this stat tonight. It took about 5 minutes to update the software, After that it was up and running. I like the ability to program it on the computer where the complete schedule is right in front of you and easy to view and make changes. Easy to install works great, but once it glitches out and you have to Google the t-stat and fix the issue by yourself you will think again. The Honeywell manual doesnt cover any of the errors that can pop up and does not cover the extra configuration that is running in the back ground. The support center is open on a select time and does not have a 24/7 support.